Hana Pharma said its new general anesthetic drug remimazolam demonstrated efficacy and safety in a phase-3 trial. The company specializing in anesthesia and pain relief unveiled the result of the phase-3 REVOLUTION STUDY, which was completed in October, at a hotel in Daejeon, Monday. 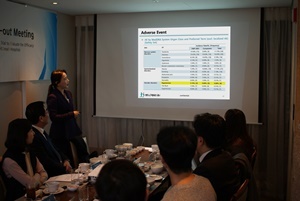 Hana Pharm unveils the result of the phase-3 REVOLUTION STUDY at a hotel in Daejeon, Monday. The study compared the efficacy and safety of remimazolam with those of propofol, a short-acting intravenous anesthetic agent. The result showed that remimazolam had the same effect as propofol for induction and maintenance of general anesthesia, with fewer side effects. However, those injected with remimazolam had a lower incidence of side effects of reduced blood pressure, hypotension, low heart rate, and slow pulse compared to the propofol group. Remimazolam is safer and it is also possible to use a reversal agent, Park explained. In 2013, Hana Pharm had an exclusive deal with Germany’s Paion to develop, manufacture, sell and manage remimazolam in Korea. “Remimazolam, a sedative and narcotic drug, is emerging as an alternative to propofol, as the abuse of propofol and its side effects have become a problem,” an official at Hana Pharm said. Remimazolam is expected to take over conventional anesthetic drugs rapidly because it will be the first newly developed anesthetic medicine in over 20 years, the official added.